1. Select trip route, date, number of passengers. 2. Register or Log-in to your account. 3. Provide passenger details and choose your seats. 5. Receive and Print confirmed itinerary. Do I get instant confirmation for my booking? Yes, you will see real-time availability of trips and seats. When you book, your reservation will be held until your payment is confirmed. Online booking is not available for trips schedules less than 24 hours. 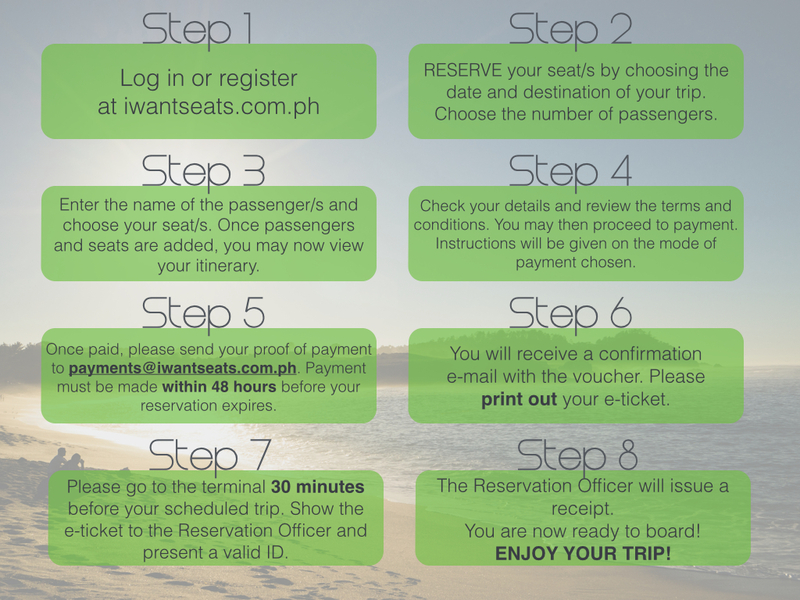 Philtranco processes online booking payments through its partner, iWantSeats. You may pay via iWantSeats payment channels to BDO, BPI, GCash, PayPal, ECPay network (7-Eleven, etc). Details are provided upon checkout. Please pay and confirm your booking within 12 hours. Unconfirmed bookings are auto-cancelled and would be available for booking to other customers. Do I need to print my itinerary? Please print and present your confirmed itinerary to the Philtranco terminal officer so they can issue your boarding ticket. Please check in at the terminal at least 30 minutes before your scheduled trip. Reserved seats that are not checked-in would be open to chance passengers at the terminal. Can I cancel or rebook my trip? Modifications in booking are possible and subject to fees based on operator’s policy. Yes, you can assign your preferred seats. In Assign Seats page, simply click on the passenger name and choose the seat.